I just finished reading Uncle Tom’s Cabin for my American Literature class and I loved it. In the book Stowe asks the question, “Can Love Conquer All?”. Most people would claim that love can surely change the heart of someone who is open to being loved, but what about the person who has never known the definition of love? Is love so powerful that it can reach deep into the black hole of humanity and pull out the wretched victims of doubt? Can love really change someone’s being? In the book, Uncle Tom’s Cabin, Harriet Beecher Stowe attempts to answer this question. Writing the story of two separate girls, growing up in different social worlds, and their meeting, she challenges us to question what love really is. Is love defined by its definition or by the actions preceding the definition? The first girl, Topsy, was born into the world and treated like an animal. Growing up, she served in a restaurant where she was beaten with any instrument that came into the hand of her heartless master and was raised in complete submission to abuse. Augustine St. Clare noticed this “odd, goblin-like” young girl and bought her from her master. St. Clare gives Topsy to his sister, Ophelia, telling her to train and instruct Topsy. Ophelia’s attempts to “break” Topsy fail and finally Ophelia is ready to wash her hands of the girl. But how can Topsy’s obstinacy amaze us? Never knowing a kind word, or a courteous action Topsy believed that she was inherently evil because she was black. Entirely numb in soul, she had no desire or inclination to be ‘good’. While the other girl, Eva, was born into the world with all the privileges of the world welcoming her. With blonde hair and blue eyes, she was the perfection of beauty. 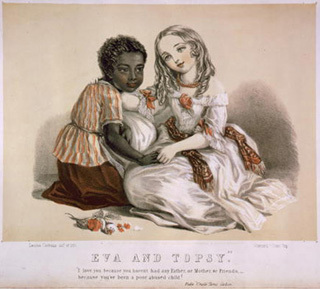 As Uncle Tom noted: “…To him she seemed something almost divine; and whenever her golden head and deep blue eyes peered out upon him…he half believed that he saw one of the angels stepped out of his New Testament…”. Yet even with all of these pleasures and privileges surrounding her, Eva chooses to conform not to the selfishness of flesh, but to the Love of Christ. Eva, like a saint, loves the people around her regardless of their station in life. Regardless of their race, character, and demeanor Eva gives all she can to love people well. Love was something that Eva gave for every human being as a gift. Without desiring anything in return, she gave. Without desiring recognition, she gave. Without receiving thanks, she gave. The vulnerable innocence of Eva’s wisdom leads to her realization that Topsy does not need the strict forms of religion but rather the reality of the Christian faith: feeling loved. By the giving out of love, Topsy’s heart is opened and Eva immediately takes the opportunity to share that “Jesus loves all alike: and that “He is just as willing to love you, as me. He loves you just as I do – only more, because He is better”. I don’t think we will ever understand the simplicity and the power of a loving look, word, or action. By a simple hug a revelation hits Topsy for the first time; that she is valuable, that someone believes in her, that she is loved, and through this revelation the breeze of hope blows for the first time over her barren soul.